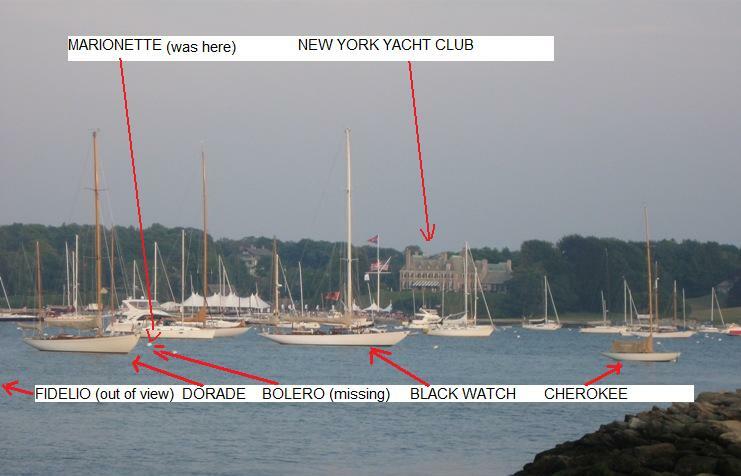 d) do some partying at the New York Yacht Club station in Newport - daughter Nicole was racing in J-105s as part of the NYYC Race Week. We got most of it done but it took a little longer than planned. Thursday, July 15, 1400 hrs. No wind, very hot, mid/high 90's (Northeast experiencing near record heatwave), motor sailing with main (needed the shade!!) Slack going to favorable current, averaging 4.5 knots. Changed plan and decided not to motor all the way to Block Island (6 hours). 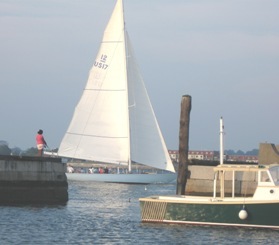 Instead stayed along coast and went in to Stonington at the eastern end of Fishers Is Sound, and planned to sail to Newport from there on Friday. 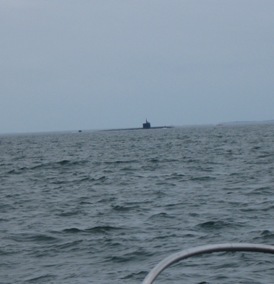 Got a lighthouse picture at New London Ledge, above left, and a 'boomer', a nuclear sub, above right, leaving its base up the Thames River in Groton (New London). 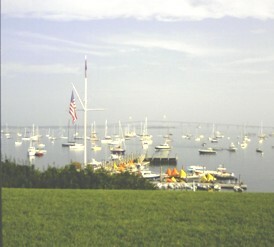 Stayed on a mooring at Dodson's Boat Yard in Stonington Harbor (left center of photo at left). Great launch service, no dinghy being towed on this trip. Dinner was lobster roll, fries and Mystic IPAs at the bar at the Dog Watch Cafe while trying to count the Hinckleys and Concordia yawls in the harbor. Friday, July 16, 0600 hrs. Fog, no wind. Motored out the harbor with the main up, a little created apparant wind across the main, making 5/5.5 knots with a favorable current. Heading for Newport via Point Judith - about 30 miles on the rhumb line. 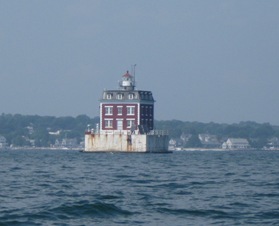 Above picture is Latimer's Reef Lighthouse on Fishers Island Sound just west of the Stonington Breakwater. 1000 hrs approaching Point Judith's Harbor of Refuge, light breeze starting, fog lifting a little. Fighting 1-1.5 knot current. Hot! At Point Judith the breeze picks up a little, a very tight beat, current now favorable going into Rhode Islamd Sound, big rollers coming off open Atlantic, motor sailing at 5 knots on main and blade jib. 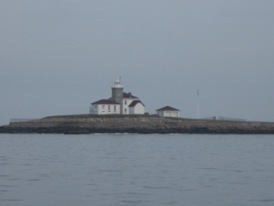 Now heading for the Beavertail lighthouse at the southern tip of Jamestown Island. 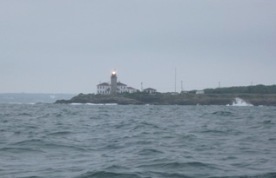 After passing the Castle Hill Light on Newport Island we round up, drop the sails and motor up the channel into Newport. At 1230 hrs we rounded Fort Adams close on our starboard side, binoculars at the ready, and picked up a open mooring in front of the Museum of Yachting. 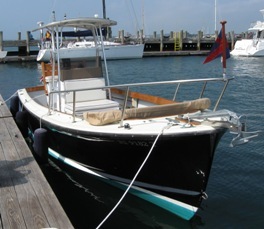 On our stbd quarter was a boat named Fidelio, out of view in the photo below, Dorade was on our stbd bow, and on our port bow, a boat named Black Watch, a restored a 68' S&S design http://www.nyharborsailing.com/classic/yachts/black_watch.htm. Off Black Watch's bow was Cherokee, an Olin Stephens 6 meter, and with whom we have a connection. Webmaster Note: January 15, 2012. The above photo, taken July 16, 2010, long searched for, was found today in a totally unrelated file - an all too frequent happening. 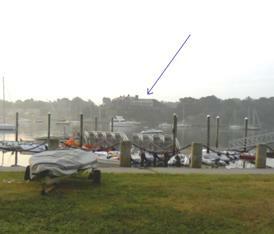 We add it here for the record - photo with corrected boat names inserted January 20, 2012..
Webmaster Note: December 14, 2010 Some trivia. 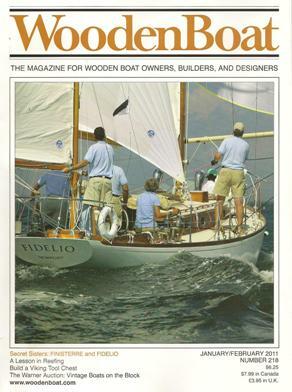 The January/February issue of Wooden Boat Magazine has a 8 page cover story entitled "Secret Sisters - Finisterre and Fidelio" by Tony Oppersdorff, Fidelio's former owner. 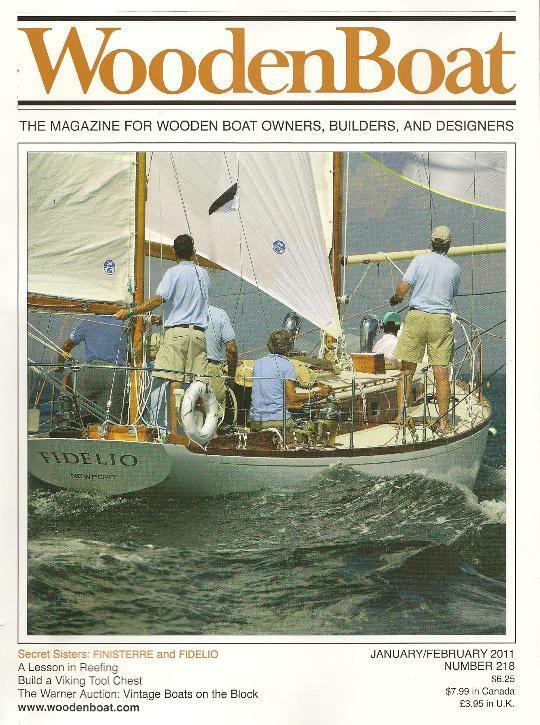 It includes a 2 page article by Caryn Davis about Seth Persson, who built Finisterre in 1954 at his yard on the Connecticut River in Old Saybrook. Some day, perhaps, we may have permission to reprint these articles, or maybe get a link to them in a PDF format. A quick call to Jay Picotte and he advised we are on Bolero's!! mooring! and we should move to the Fort Adams basin, and we did. This is a stone wall surrounded 'pool' out on the tip of Fort Adams. January 20, 2012. This is an arial view of Newport Harbor. 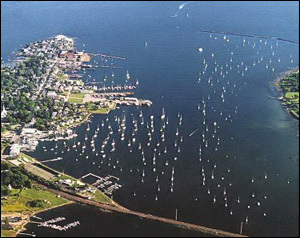 Fort Adams State Park is in the center of the photo and its 'basin' is visible out on the far left at the tip. The Museum of Yachting is barely visible to the right of the Basin. 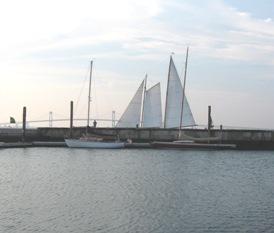 The New York YC Newport Station is center right near the edge of the photo. 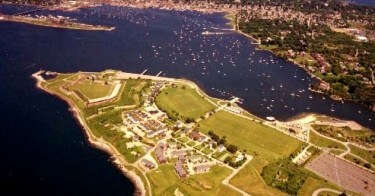 Ft Adams is also home to the famous Newport Jazz and Folk Music Festivals. At this point I met Jay and we went out to take a look at Recovery on a mooring near the International Yacht Restoration School (IYRS). We travelled in style in his Angler 22, Waterlilly, a Tripp built bass boat that Jay rebuilt into a center console beauty. We have two (work) reports related to meeting up with Jay - one about Tiller Lock Systems and the other about Ship Models Click on them to go there. Friday night was party night at Harbor Court, the NY Yacht Club Newport Station, and at a spectacular mansion on the hill overlooking Newport Harbor. Based on website legal staff advise there will be no report on these activities, except 2 pictures and a link to the Harbor Court facilities. Saturday night - decision time. Light wind forecast Sunday AM, hot, thunderstorms possible. 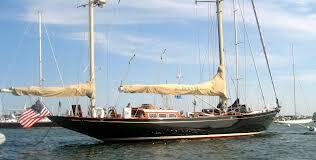 Decision, bag Menemsha and meeting up with Fred Croft and Flipper, sail back to Niantic Bay. Monday forecast, more thunderstorms and a long 60+ mile beat to windward on Monday and Tuesday to get back to Niantic Bay. Called Fred, again, and cancelled our meet in Menemsha, again. Sunday, July 18, 0530 hrs. Caught the last 2 hours of ebb tide out of Newport. Wind on the nose, as usual, motor sailing with main up. No fog. Foul current for next 6 hours but will go slack at 1200 hrs, then favorable at the Watch Hill Passage into Fishers island Sound. Hot, light wind on the nose, Arrived there on time, motor sailing close tacking upwind - are we having fun yet? Afternoon breeze picked up, on the nose still. Four hours plus later arrived at Niantic Bay YC. No thunder yet. Cleaned up and home by 6PM - in an air conditioned house. Glad to be there! If one ever needs a good argument for dependable auxiliary power this cruise is it..
.Monday, July 26, 0330 (that 3:30AM) hrs!! Left Old Lyme by car!!! for Woods Hole, Cape Cod. Checked the harbor for Dolphins (none). 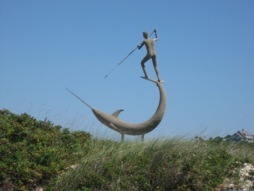 Caught the 0600 ferry to Vineyard Haven ($15.00 round trip), arrived 0645 hrs; Checked the harbor for Dolphins (none). Bought a $7 All Day Island Bus ticket good anywhere on Martha's Vineyard. 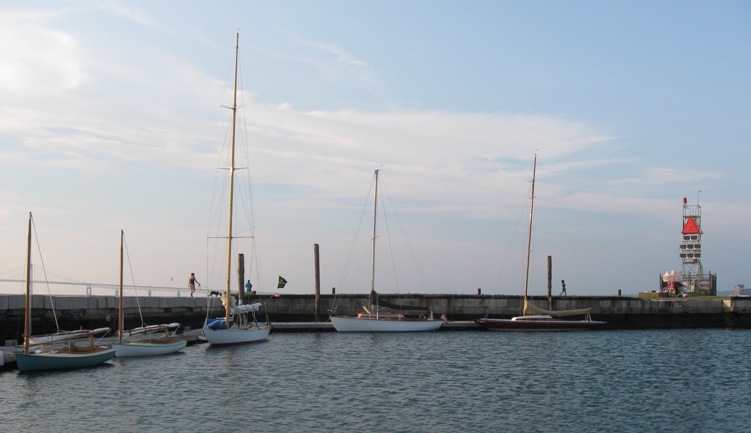 Got the bus to Oak Bluffs, checked the harbor for Dolphins (none). Had breakfast. Left message on Fred's answering machine telling him I was on the Island, and maybe, just maybe, I would make it to Menemsha. Got the bus to Edgartown, walked around, checked out the Edgartown YC, checked the harbor for Dolphins (none). 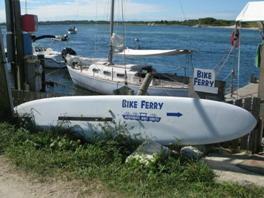 After lunch at Gay Head, and with Fred's help, caught the 1430 hrs ferry at Vineyard Haven back to Woods Hole. Back in Old Lyme at 1745 hrs. Mission accomplished! Whew!! Check out update at Flipper.